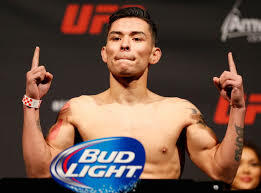 UFC 196 continues to grow as the promotion has announced that the upcoming card will feature a fight between flyweight prospects Ray Borg and Justin Scoggins. The February 6th event will take place at the MGM Grand Garden Arena in Las Vegas. Borg (9-1), who decisioned Geane Herrar in his last fight, will be looking to extend his winning streak to four. The FIT NHB fighter is currently ranked #11. Scoggins (10-2) worked his way to a UD win over Josh Sampo in his last fight, after he was defeated by John Moraga and Dustin Ortiz in back-to-back fights. UFC 196 will be headlined by a heavyweight fight between champion Fabricio Werdum and Cain Velasquez.